So many of my blog posts are about improving & maintaining the inside & outside of a home. Replacing a roof, updating a kitchen, the energy benefits of new windows, etc. I like to share these tidbits of information from my years of experience in the industry, and also because I care for so many Peak Roofing Contractors’ customers. But every once in a while, I like to step away from the hammers & hard-hats, and focus on things that are more important, not only to me, but to family, friends, and sometimes people I’ve never even met. This is one of those posts. On Saturday, October 17, with a team of my friends & family, I will be participating in the 2015 Walk to End Alzheimer’s Virginia Tri-Counties. – Currently, more than 5 million Americans have Alzheimer’s, and my heart goes out to the individuals and families who suffer from this debilitating disease. I’m walking for them, and I’m walking for my mom, whose struggles with Alzheimer’s ended three years ago this Fall, but who lives on in our hearts as the loving & caring, daughter, sister, wife, mother, grandparent, and friend she was to so many. 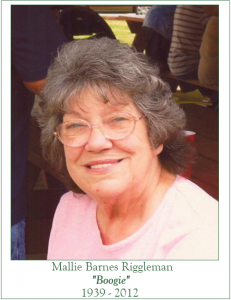 Please consider making a tax-deductible donation by clicking on the Alzheimer’s Association Walk to End Alzheimer’s® page I’ve set up in honor of my mom, Mallie “Boogie” Riggleman. Any amount is welcome and appreciated.